Earlier the winding up of the company was initiated and conducted under the Companies Act, 1956 while the same has got annulled after the advent of Insolvency and Bankruptcy Code. The 1956 act provided the right to file the winding up against the Company or Corporate Debtor owing to the inability of the Corporate Debtor to pay back the financial or operational debts owed to the creditors. if the resolution professional during the Corporate Insolvency Resolution Process but before the approval of the same, intimates the decision of the committee of creditors to liquidate the corporate debtor, to the adjudicating authority and the adjudicating authority approves the same. No action or suit or proceedings can take place against the corporate debtor once the liquidation order has been passed by the NCLT. Under the CIRP the only objective is to revive the company and discharge the liabilities of the Corporate Debtor whereas under liquidation the assets of the Corporate Debtor are disposed off by the way of auction thereafter the sale proceeds are distributed among all the creditors as per the sequence mentioned under section 53 of the code. The assets of the Corporate Debtor are sold through public auction undertaken after the public announcement where if any asset is of perishable nature that asset can be disposed of by the private sale on the priority basis. Recently NCLT in Dushyant Dave (Resolution Plan) for Sidhi Vinayak Logistics Pvt. Ltd. vs. Sidhi Vinayak Logistics Pvt. Ltd. the instant application was filed on behalf of the Resolution Professional for the liquidation of the Corporate Debtor i.e. Sidhi Vinayak Logistics Pvt. Ltd. wherein the COC in its 8th meeting passed a resolution in favor of liquidation also the important point to be noted here is that the extended time period of 270 days had expired just one day before the passing of the resolution therefore the liquidation orders were passed by the NCLT and the Resolution Professional was appointed as the liquidator for the liquidation of the Corporate Debtor. Generally the distribution of the proceeds from the assets of the Corporate Debtor takes place as per the Section 53 of IBC. As per the Section 3(30) of the IBC the Secured Creditor means a creditor in favor of whom security interest is created. 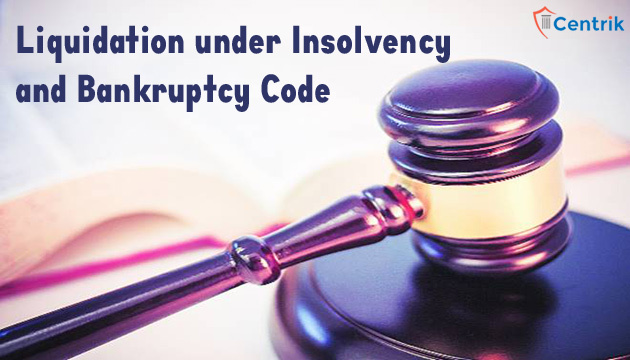 Under the liquidation process the secured creditors are given preference over all the other creditors wherein the Secured Creditor has the discretion to get the Security Interest realized and recover the amount of debt from the proceeds of that security interest or to participate in the liquidation proceedings under IBC to recover the debt amount as per the sequence under section 53 of IBC. Even though the primary purpose of Insolvency and Bankruptcy Code, 2016 is to revive the company but somehow the Corporate Insolvency Resolution Process does not get completed within 270 days from the date of admission of the application or the valuation of the corporate debtor as per the Resolution Plan is less the liquidation value of the Corporate Debtor or some concerned person getting prejudicially affected by the Resolution Plan objects the approved resolution plan or because of some other valid or justifiable reason, the Adjudicating Authority has the power to pass the liquidation orders.